I don’t read as many print books as I used to. Life got in the way and I found myself gravitating more toward audiobooks since I could multitask and listen to books that way. Every now and then though, I find myself faced with a quandary: I want to read a book that the library only has in print and that isn’t available as an audiobook in OverDrive. If that happens, I have to find the time to sit still and read. My latest print book read was Everything, Everything by Nicola Yoon and I’m glad I forced myself to take the time to sit and enjoy it. 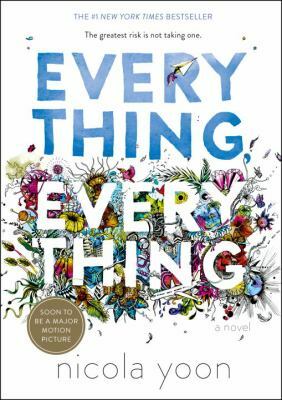 Everything, Everything, I’m sure most of you know, is now a major motion picture, but that isn’t how I came to know this book. I had read Yoon’s other book, The Sun is Also a Star, and loved it. It’s an angsty teen love story that deals with deportation and a lot of other really relevant teen and adult topics. That book has also won a lot of awards. After I finished The Sun is Also a Star, I decided to give Everything, Everything a try to see if it was worth all the hype the movie was bringing to it. I’m still up in the air about it, even though this book is written beautifully with diverse characters present throughout. Everything, Everything tells the story of a terminally ill teenage girl who falls in love with a perfectly normal teenage boy. (If you boil down all the plot elements, that’s basically it, BUT don’t do that. It’s so much more, like HUGE plot twists that even I didn’t see coming.) 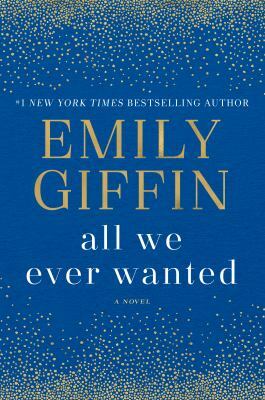 Family dramas abound, both inside the bubble and out, first love feels galore, and traditional teen mixed up feelings are all over this book. 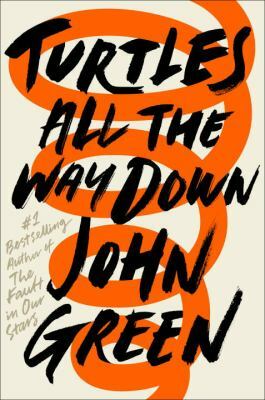 Add in a messed-up medical condition, a parent who is a doctor, and the deaths of family members and this book will drag you on a roller coaster of feelings from the first page to the very last. Madeline is an Afro-Asian teenage girl who cannot remember the last time she has been outside of her house. She has a very good reason. Madeline Whittier is allergic to the outside world. She can’t go outside, breathe fresh air, feel the sun, nothing. If she did, she could die. Maddy hasn’t left her house in seventeen years and only has contact with her mom and her nurse, Carla, on a daily basis. Her compromised immune system has left her isolated. Maddy is stuck in her air-locked house and has come to terms with it. Until the day a moving truck pulls up next door. Drawn to the window out of pure curiosity, Maddy watches a family clamor out of the moving truck and take in their new surroundings. Maddy finds herself staring at the teenage boy who is lanky and dressed in black from head to toe. He catches her staring and they lock eyes. That’s the first time Maddy sees Olly and her life is changed forever. Maddy quickly wants to know more about Olly and his family. From watching them, she discovers some normal, as well as some troubling, things. Maddy and Olly quickly start ‘talking’. They window communicate, IM, email, and all this leaves Maddy wanting more and more. Olly does too. What is she willing to risk for friendship and love? Will Olly accept her? What will her mom think? What will her mom do? This book is a fantastic read. Going beyond the traditional angst of only being separated from your crush by your parents, Maddy’s disease is the one separating them. It’s a fascinating read that delved into some pretty deep topics. I’ve been reading a lot of young adult fiction in my spare time. A vast majority of them have dealt with sad topics: mental illness, suicide, death, endings of relationships, abuse, homelessness etc. These are all topics that teens deal with on a daily basis, so I appreciate the fact that there are resources out there that teens(and their parents/guardians/loved ones) can turn to if they need some help. However, reading all these angsty books with no break and with no happy ending in sight is throwing me down a rabbit hole of sadness. 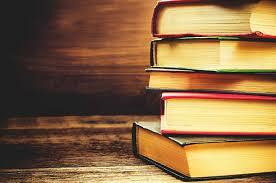 I needed a break or a book with a happy realistic ending, not a sad realistic ending. Enter Jennifer Niven. I’d read All The Bright Places by Jennifer Niven last year and had loved her work (fair warning though: this book has a sad realistic ending dealing with mental illness and suicide). Flipping through a review magazine, I found Holding Up the Universe, also by Niven. The premise sounded like it could possibly end well and I was willing to risk it because I had loved her previous book so much. 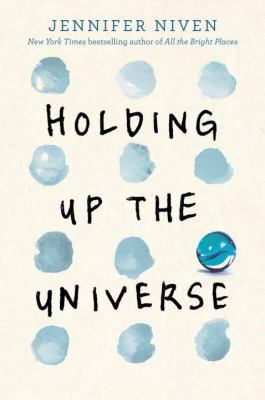 Holding Up the Universe tells the story of Libby Strout and Jack Masselin. It is told from both of their points of view, alternating chapter to chapter. Libby Strout was once known as “America’s Fattest Teen”, a teen whose house had to be partially demolished in order to get her out of it. Back in school for the first time in years, no one can see past her weight. She’s still just the fat girl even though she’s lost 300 pounds. After her mom’s death, Libby is left picking up herself, her father, and their grief. She is ready for the new start high school has to offer. Jack Masselin is the quintessential high school popular boy. He has swagger and the ability to give people what they want. He is able to fit in. While he seems like he has it all together, Jack has a major secret. He cannot recognize faces. Jack has prosopagnosia, the inability to recognize people by their faces. Everyone he meets, he has to try to figure out who they are by their identifiers: big hair, beauty mark, Mohawk, etc. Jack gets through life by being the funny, charming guy, but doesn’t let people get close. Jack and Libby’s lives become entangled together in the aftermath of a cruel high school game. Sitting squarely in community service and group counseling together forces them to make a connection. This connection changes both of their lives, forcing them to confront issues that neither of them realized they are carrying. Will their connection change their world for the better or for the worse? Add in cruel high school students, family issues, obesity, brain injuries, and the possibility of love and Jack and Libby are in for a crazy ride of self-esteem, self-reliance, and teenage angst. Holding Up the Universe was the exact book palette refresher I needed. I grew up slipping Archie comics into my mom’s cart every time we went to the grocery store. I don’t know what it was about the characters, but I always wanted to learn more about Archie, Betty, Veronica, and Jughead. I was always guaranteed a funny story line and a few laughs. When it was announced that Mark Waid and Fiona Staples, two of my favorite comic book writers and artists, would be launching a modern reboot of Archie, I knew I would have to read it. Archie, Volume 1: The New Riverdale is Waid and Staples’ modern reboot. The characters in this reboot face contemporary issues, while still retaining the classic Riverdale antics that original readers fell in love with. This modern Riverdale High is multiethnic and full of characters that readers of various ages, sexual orientations, genders, and economic statuses can relate to. In this first volume, Archie talks to readers about Riverdale and introduces his friends and family. Jughead rocks out in ripped jeans and readers see Veronica stroll onto the scene as a reality show star living with her uber-rich parents. Betty and Archie aren’t talking after the #lipstickincident and readers, as well as everyone else in the comic, are left wondering what happened to break up this couple that has been together since kindergarten. The world Waid and Staples have designed is true to the original, but allows for flexibility for all characters. Waid and Staples have concocted a world full of new possibilities for Archie, Jughead, Betty, and Veronica to explore, while still keeping the foundational aspects of each character intact. If you’re like me, you may have been initially hesitant to open this comic for fear that your favorite character may have been completely changed. Never fear! Archie is still a complete buffoon, Jughead is still obsessed with getting food, Betty is still the girl-next-door tomboy, and Veronica still slightly scares me with her vain, spoiled, and conceited attitude. All your favorites are still here just waiting to be rediscovered! This reboot works as a way to introduce modern themes into the classic lives of all the Archie characters. Social media, fashion, romance, wealth, and other topics are all introduced into their lives and the struggles that each character goes through are all relatable to people reading. 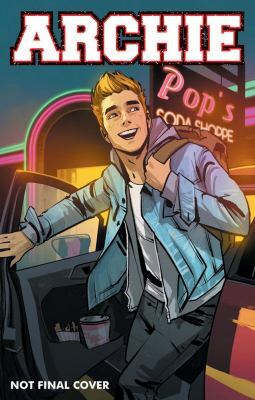 This first volume plugs Archie into the mainstream, reality-star culture by introducing characters through writing and artwork that is bright, popping, and fill of dramatic relatable topics. Check it out and let me know what you think! If you are raising a teenage daughter, no doubt you could use some support. 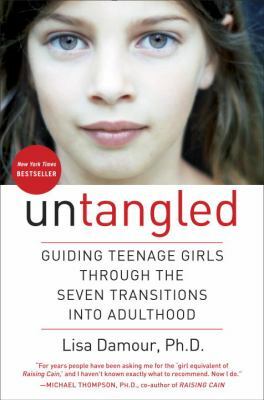 You will find it in Lisa Damour’s Untangled: Guiding Teenage Girls Through The Seven Transitions Into Adulthood. In this book Damour, who also directs Laurel School’s Center for Research on Girls in Shaker Heights, OH and writes a column for the New York Times’ Well Family Report, outlines seven transitions that adolescent girls must navigate on the way to adulthood. Identifying such transitions helps prepare us for their arrival so that we don’t feel so bewildered once they arrive. It helps prepare us for the reality that, just as we get used to a new “normal” everything can change all over again. It also helps us take care to experience each stage of development without getting stuck somewhere along the way. If the idea of identifying stages of human psychological growth appeals to you, but you don’t have teenage daughters, you may be interested in Nature and the Human Soul: Cultivating Wholeness and Community in a Fragmented World by Bill Plotkin, which identifies 8 stages spanning the entire human lifespan. Reading such books helps us better know ourselves and our relationship to the world, to better understand where we’ve been and how it has shaped us. If the ancient Greek adage “know thyself” has any relevance, then I think it naturally follows that “know thy offspring” would, too. After all, whether we want to see it or not, they often provide a reflection of some aspect of ourselves. This is a superhero comic book, but not your typical one. While there is a significant amount of crime fighting and struggling with inner demons, writer Brennan Lee Mulligan and artist Molly Ostertag have incorporated necessary humanity into the lives of their superheroes and villains, allowing readers to become more attached to their daily lives outside of being more than normal. 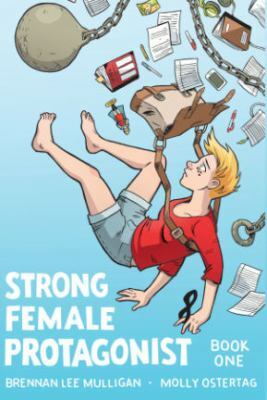 Strong Female Protagonist dives into the life of Alison Green. Alison used to be an active superhero. When she was younger, it was discovered that she was one of many teenagers who had “biodynamic anomalies,” in essence they were different than normal people. These anomalies allowed her to become Mega Girl, her superhero alter ego with super strength and invulnerability to injury, heat, cold, and many other things. Alison and other heroes went about life fighting crime on a day-to-day basis until she had an interaction with her nemesis, the villain Menace, who has the ability to read minds. This encounter forces Alison to take a close look at her life fighting crime and decide whether or not she wants to continue being Mega Girl. Flash forward and now Alison is going to college and trying to balance her superhero side with the normalcies of college life. She still wants to save the world, but does not necessarily want to be forced to do so while hiding behind a mask. She shouldn’t need a mask to be a hero. After all, everyone has different opinions on what really constitutes being a hero. While this book follows a fairly straight storyline, there are some flashbacks, as well as a running commentary at the bottom of each page that allows readers to break away from the seriousness of the comic to revel in the writer’s witty commentary. I felt like those sentences added to the events happening within the book and even allowed me to garner a little insight into the writing and artistic processes that went into creating this book. Check this out if you want a break from the traditional superhero graphic novel, but still want to see some battles alongside a “normal” life.